For close to a century, nursing education at the University of Toronto has demonstrated its commitment to leadership by pushing boundaries, by advancing education — and by changing lives. “Firsts” are nothing new at Bloomberg Faculty of Nursing. We got our start in 1920 through the groundbreaking initiative of Ms. E. Kathleen Russell. By all accounts a world leader in education innovation, Ms. Russell established the Department of Public Health Nursing as experiment in educational science. Her vision was to improve upon the traditional hospital-focused training of nurses by including social welfare and public health education — a radical notion at the time. Ms. Russell’s determination and foresight served to bolster the education of leaders in administration, education and public health for Toronto, Canada and the world — and meet the demand for nurses following the Spanish Influenza pandemic of 1919. Not satisfied, Ms. Russell then pioneered the first nursing program in Canada to be completely university-based. In 1928 the Department became a unit of the School of Hygiene. In 1933, we were recognized as an independent School of Nursing. Then the original three-year program evolved into a four-year BScN degree program in 1942 — another first in Canada. Ms. Russell and the School were lauded internationally for their progressive approach to learning, thus establishing the “Toronto model of education” around the world. 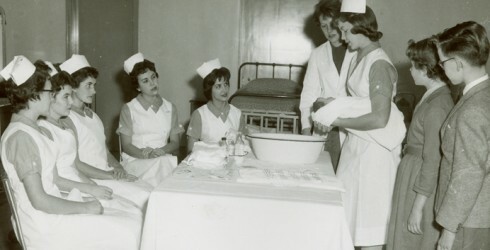 The education and practice of nurses continued to evolve. So did the School. We established master’s program in 1970, which led to faculty status in 1972. The PhD program followed in 1991. And in 2001, we again led the country by creating a major new role for nurses through our Master of Nursing Acute Care Nurse Practitioner Program. This innovative online master’s opened the door to a range of practice roles for advanced practice nurses across Canada. Demand for highly qualified applicants only grew. So we initiated a groundbreaking two-year Second Entry (or accelerated) Bachelor of Science in Nursing for suitably qualified applicants, phasing out our four-year undergraduate degree. This highly effective approach to nursing education has since been adopted across the country. Over the 1980s and 1990s we rapidly built our reputation as a research powerhouse. Our faculty attracted world-leading researchers and scholars in health services and administration research. We initiated many clinical trials and care evaluations. And we pursued key health issues through qualitative research and critical inquiry. Today, our faculty continues to shape nursing practice and policy as we train the next generation of teachers, researchers and leaders though our renowned PhD program. In 2007, we received an historic donation from financier and philanthropist Lawrence S. Bloomberg — the largest ever given to a Canadian nursing school. To recognize this visionary gift, we proudly became the first named faculty of nursing in the country. As the Lawrence S. Bloomberg Faculty of Nursing, we continue to honour our history to transform research into results, scholarship into leadership and innovation into quality care.